Intelligent and game, the Kerry Blue Terrier is truly an all-purpose dog. Originally bred to hunt and retrieve, Kerries can be found today in the show, obedience, agility, herding and earthdog rings. The Kerry?۪s trademark soft, wavy coat can range from deep slate gray blue to light blue gray. Kerry Blues are born black and, if correct, possess the dominant gene for coat fading. They will fade and acquire their adult color by 18 months. A native of County Kerry, Ireland, the Kerry Blue Terrier was used as an all-round working and utility terrier, responsible for hunting small game and birds, retrieving from land and water, and herding sheep and cattle. It is thought that the peasantry of Ireland developed the Kerry as an answer to the nobility using Irish Wolfhounds. The Kerry was used to help the peasantry to silently hunt the noble hunting grounds. 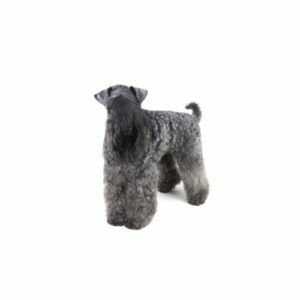 Energetic and fun-loving, the Kerry Blue Terrier enjoys being part of a family. They possess a typical terrier personality though and require daily exercise and firm and patient training. Families with other pets should beware; as hunters, Kerries may not accept cats or small pets. Their coats are hypoallergenic, but still need to be brushed and trimmed regularly. Terrier Group; AKC recognized in 1922. Ideal size is 18?_ inches tall at the shoulder and 33 to 40 pounds, with females slightly smaller. Farm dog; small game hunter; retriever. Daily moderate to extended exercise. Regular professional grooming is recommended. Are you interested in purchasing a Kerry Blue Terrier?